I’m no chemist guru, but I am a healthy products connoisseur. I’ve tested several brands of non-toxic cleaning products, and only a very few have met my ingredient requirements and performance standards. 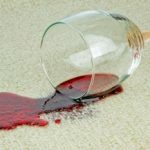 My philosophy is higher quality and less quantity — I prefer to have one excellent non-toxic cleaning item than six chemical-laden ones. I keep my cleaning routine simple and streamlined. I prefer a natural finish, and do not like my products to call attention to themselves. 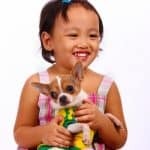 If you are currently switching to chemical-free cleaning products and want to skip the trial-and-error product testing I went through, use this post as a guide. Designed by a naturopath and formulating chemist from the ground up, for people with skin and chemical sensitivities. 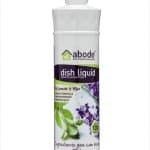 The Abode Lavender & Mint Dish liquid is a great smelling, delicious lathering product that has been formulated to be gentle on your hands and the environment whilst cutting through grease with power, similar to other leading brands. This unique formulation does away with nasty chemicals such as cocobetaine, sodium lauryl sulphate and ethoxylated ingredients that was designed to leave your dishes sparkling clean with no chemical residue. Formulated using the best ingredients money can buy, Abode uses food grade ingredients (where they are available) NOT industrial grade which are often contaminated with heavy metals. 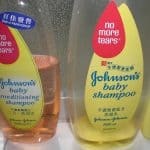 The concentrated formula makes it remarkably economical when compared to similar brands on the market. Great value for money without compromising performance. Ingredients You Can Trust! water, alkylpolyglucosides (derived from coconut, wheat and corn and found in high end personal care products), sodium coco sulphate (derived from coconut oil), sodium cocoyl isethionate (derived from coconut oil), citric acid (food grade), sodium citrate (food grade), glycine extracts (amino acids) and pure lavender and mint essential oils. Benefits grey water and septic tanks safely and best of all, Australian made and owned. Sick of buying ‘natural’ laundry powders that don’t perform and still irritate your skin? Look no further, this range has been specifically designed for you! 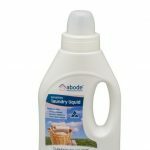 The Abode Sensitive Laundry Powder is one of the most popular Abode products that has been made for the most vulnerable in our society – pregnant women, children, the elderly and people with skin and chemical sensitivities. Made from the best quality ingredients that money can buy, it is free from fragrances, petrochemicals, zeolites, phosphates and salt found in most conventional products. Best of all, it is so concentrated you only need to use a tablespoon not a scoop! Ingredients You Can Trust! Soda ash (alkalinity builder), baking soda (food grade), sodium citrate (food grade), sodium carboxymethyl cellulose (derived from coconut oil), sodium coco sulphate (derived from coconut oil), sodium disilicate (derived from sand), alkylpolyglucosides (derived from corn, wheat and coconut) and sodium lactate (food grade). “For the first time in 20 years, I can throw out my soap nuts and use a laundry powder without reacting adversely to it” (Tracey William, chemically sensitive). Again, 100% natural is the winner for me. They list all their laundry products here. 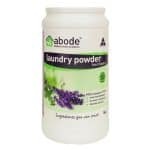 Even many natural laundry liquids and powders contain questionable ingredients, but I always feel safe with Abode. I rely on just two cleaning products to suit my home. The Dish Drops in Lavender, a neutral, gentle aroma, for daily use. The texture feels as soft and gentle as a pure soap hand wash. When I want to launder, I choose the laundry powder in lavender, a gentle contribution to the environment and us. 100% whitener? Come on in for a whiter clean, brighter glow. I don’t usually use a bleach. If I do, I just add a little bit to the wash, (only items that really scream out for it), wash well, and call it a day. Drying, I use the washing line outside in the sun, it is inexpensive and I’ve had the same scenario all these years. Everyone gets it for free. Visit this wonderful business and join us in celebrating amazing natural products for your home. Join the Australian NATURALLY CONSCIOUS revolution! At Naturally home, we are passionate about helping you transform your home, room by room, into a ‘chemical free‘ sanctuary. 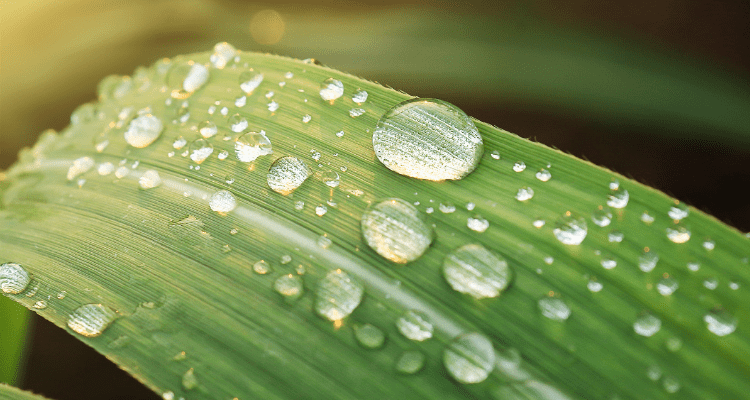 Our aim is to make it simple for you to take a step towards a healthier home, a healthier family and a cleaner planet, by saying NO to the toxic chemical overload we have unconsciously become accustomed to. I hope you enjoyed this peak into my natural cleaning cupboard. So, what’s it like at your place? Note: As kids we were encouraged to do the washing up in pure Sunlight soap every night, really clean out our bedrooms, move clothes along every season as we grew. Mum washed 2 to 3 times a week either using a hot copper and wringer on some days or original Lux flakes in a normal wash. By the time I’d left home, the cleaning isle in the local store became a no-go zone due to the overwhelming fragrances. I struggled with other people’s choice of laundry care when the kids stayed over night or they came home from staying at friends’ around about the last 20 years, not musty or mouldy smell, the strong aromatic fragrances. Unprecedented fragrant laden days in my opinion have been more intent since last 6 or so years, fragrant laundry products stimulating consumers sense of smell, leaving your laundry scented even after 30 days. I know when I step outside the door, the neighbour has been washing (we have 6 foot fence boundaries here in Sydney) or the people I come in contact with have clean clothes. I sense it at least 5 to 6 metres away while I walk to the shops, sit on the bus or meet in an office. My reaction is instant mayhem from feeling suffocated, skin tightens around my face, feeling ‘polluted’, extreme exhaustion and my limbs deteriorate into slow down, lasting all day till I shower and go to bed. Diethyl phthalate happens to be one of the main ingredients in synthetic fragrances as it makes the fragrance longer-lasting.